Boy and Bear. Judah, one week old and very, very special! 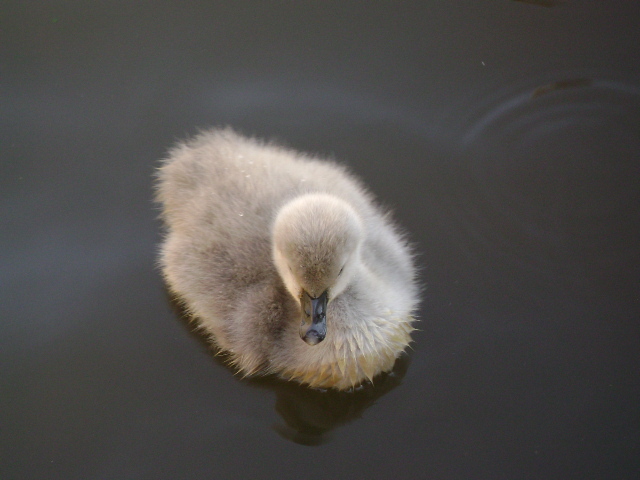 A few weeks ago I celebrated the birth of six cygnets in the pond outside our home in a post called New Creation. The cygnets are doing well; we thought we had lost one in the first couple of days, but discovered it was simply hiding out on mother’s back. Now they are growing quickly, people stop to ooh-and-ahh, and their little necks are beginning to lengthen. 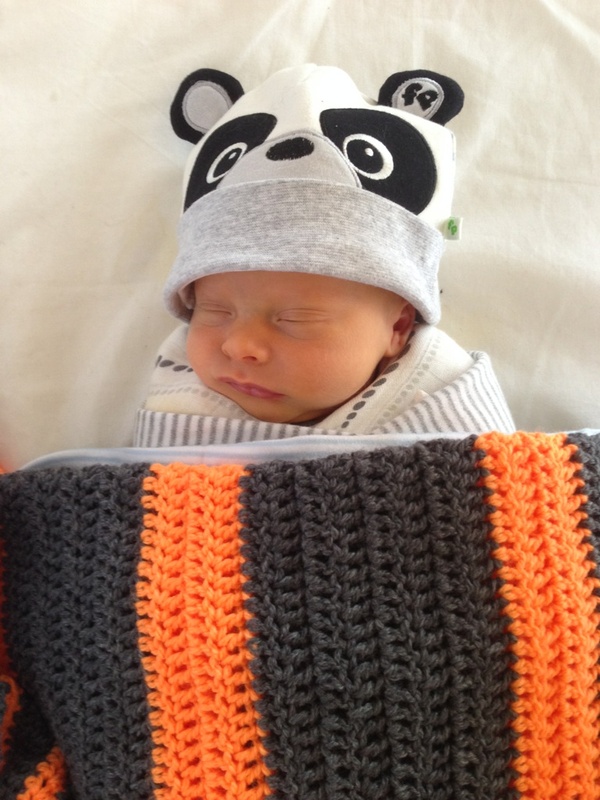 Two weeks ago an even more wondrous birth occurred: that of Judah Alexander, our new – and first – grandson. God is the Creator and his most encompassing creation is human life, a baby. We, as participants in creation, do it too. When we beget and conceive, give birth to and raise babies, we are in on the heart of creation. Every birth is kerygmatic. There is more gospel in all those “begats” in the genealogical lists of our Scriptures … than we ever dreamed. … Birth, any birth, is our primary access to the creation work of God. I was a latecomer to this firsthand experience common to most fathers today and common to the human race as a whole. Does anyone ever get used to this? I was captured by the wonder of life, the miracle of life, the mystery of life, the glory of life. … Nowhere I have ever been and nothing I have ever done in God’s creation rivals what I experienced in that birthing room. The setting was austere – antiseptic and functional – but the life, the sheer life, exploding out of the womb that night, transformed it into a place of revelation. Welcome, Judah Alexander; you are very welcome indeed. May you be blessed of God all your days, and your parents with you. James’ opening salvo is as firm as it is strange. Unlike most New Testament letters which begin with a blessing and/or a prayer, James is straight down to business, exhorting his listeners to consider it “all joy” whenever they face trials of any kind. The focus on joy (chara) builds on the final word of the first verse Greetings (charein, or literally, Rejoice! ), and so forms a link between the opening verse and the new section. The exhortation is addressed to “my brothers and sisters” (adelphoi mou), that is, fellow believers and as such those who are in the family. James is calling for a fundamental and radical shift of attitude. Whereas we typically view trials as a source or occasion of displeasure, anxiety, frustration or even despair, James calls us to view them as an occasion for joy. To consider something is an exercise of mind, will and vision, especially in a circumstance in which trials are anything but joyful. Vlachos (16) notes that the verb (hēgēsasthe) in the New Testament is almost always used in terms of a value judgement. Thus, in spite of their discomfort or distress, the believer is encouraged to view their trials in a new light, and so to respond to them in an unexpected way. Not only are they called to rejoice in the midst of trials, but to see the trial itself as an opportunity for rejoicing. James calls his audience to adopt this posture whenever they fall into all kinds of trials (hotan peirasmois peripesēte poikilois). The word for trial (peirasmos) can refer, depending on context, either to temptations towards sin which arise from within (cf. v. 14), or to the kinds of afflictions which press upon us from without. Here the second meaning suits the context best, for these are trials that we fall into. McKnight (75-76) argues that James has in mind a very particular context of economic hardship and oppression, and the subsequent temptation faced by his audience to react to this hardship with anger and violence. However the general terms used by James in this text (whenever, any kind (poikilois basically means various)) suggest that he is thinking of trials in general, of trials whenever they come, and of trials in any and all guises. Thus, in all the various kinds of trial and affliction that a person may encounter, James offers this counsel: rejoice! J. B. Phillips’ rendering of this verse captures the sense James intended (478): “When all kinds of trials and temptations crowd into your lives, my brothers, don’t resent them as intruders but welcome them as friends!” Just why and how a believer might do this is the theme of verses 3-4. In contrast to those who see Barth espousing act-deontology, situationalism or intuitionism, I understand him as endorsing a version of the Augustinian and Thomistic view that right living is in accord with created nature. To be good is to live in the truth about ourselves, to live in conformity with God’s intentions for created order. On my reading Barth thus holds God ought to be obeyed not out of mindless obedience but out of regard for our own good and true happiness. God requires no more, no less and no other than for us to fulfil our true being (10; cf. 42-43). Karl Barth as a natural law ethicist? Not quite. Rose develops his argument in two parts which correspond roughly to an indicative-imperative pattern he sees in Barth’s theology (92). In the first part Rose provides a helpful presentation of Barth’s theological ontology with three chapters discussing the nature of God, creation, and humanity respectively. The God made known in Jesus Christ is that God who from all eternity and to the very depth of his being has turned toward humanity in love, uniting humanity to himself, and who has become humanity’s partisan. The whole of creation is, of course, God’s creation, and Jesus Christ is its secret: its origin and basis, telos and truth. As such, there is an inherent creaturely order that reflects God’s deepest intentions and which provides “the deep structure of the moral life” (59). This order and structure, however, is not given as a universally accessible rationality, and in this, of course, Barth departs from the classical tradition. Human being is christologically determined. Rose notes that Barth distinguishes between “real” humanity and “phenomenal” humanity: our truest and deepest humanity is in Christ, and as such is fundamentally active, relational and open-to-God, this latter not by creational grace or “nature,” but by the divine determination of election. These three chapters offer an account of the true nature of the reality within which humanity has its being, and which is also determinative for its life-act. Part two is comprised of four chapters in which Rose explores Barth’s doctrine of the divine command (chapters four and five), and particularly, the command of God the creator (chapters six and seven). Rose defines the divine command as “nothing other than the divine nature itself interpreted with reference to human nature” (93; cf. 138, 155). Since the divine being is made known in God’s saving activity, the good is a predicate of revelation. “God’s being is itself imperatival, having the character of law” (95). Again, the divine command does not annihilate human willing but is instructive and illuminating, effecting a radical moral awakening in which the human agent discovers the truth of their own being and understand the command as their highest good. Rather than an occasionalist and particular command for each new moment, it is rather the determination of our entire being and existence to bear the image and likeness of God. In becoming “godlike,” we realise our true humanity. Barth therefore thinks that what Christians ought to do has already been done. God has not only acted rightly toward us but has acted rightly on our behalf, making the good life something of a fait accompli. … God’s achievement is our incitement. What Barth has in mind when he speaks of obedience is consequently an active alignment of divine and human action … Acting in “correspondence” to God’s command means to be a response or echo to it in the sense of participatory engagement—a “Nachleben” (119-120, original emphasis). Chapters six and seven supply an overview of Church Dogmatics III/4 with a brief exposition of the main lines of Barth’s discussion of the command of God the creator, with a focus on Rose’s own particular concerns. Rose argues that for Barth, the created order is inherently imperatival. That is, the structures of creaturely and human existence constitute the means by which the command of the Creator reaches us. “There is an internal coincidence between the order of creation and the order of obligation. To become aware of the theological ground of our existence therefore is to become aware of the moral law; knowledge of created order is moral knowledge” (138, original emphasis). Rose approves Barth’s “classic” view of freedom—his organising motif in the ethics of creation—in terms of teleology rather than modern conceptions of unrestrained personal autonomy. The most fundamental freedom is, of course, freedom for God. This fundamental freedom—established and made possible only by redeeming grace—grounds all other freedoms and relationships. Humanity is at its truest and realises its own true being only in this “natural” relation with God, which then issues into a fundamental relationality toward others. These relations, of course, and this freedom, are distorted, threatened, and at times, torn asunder by human sinfulness and evil which arise from the mysterious Nothingness; this is the focus of the final chapter. Rose’s main point is simple: although humanity chooses sin and is thus responsible, yet sin itself, and its ground in Das Nichtige has no ontological foundation: it is alien to human being and thus against nature. “Sin represents our insane, preposterous, bootless attempt to separate ourselves from the source of our life and being and therefore from ourselves” (190). In a brief but important epilogue Rose considers whether, for Barth, revelation is the sole source of Christian moral reflection, and answers with a decisive No on the grounds that Barth had always acknowledged the particular work and task of philosophy, and that he allows some measure of moral knowledge arising from “truths known and knowable to all human beings” (207). Rose knows his argument will not convince all readers: “The interpretation may … seem strained. Is not Barth being read against the grain”? (115). Rose is aware he is explicating a “minority report” in Barth (82), and indeed gives evidence of his procedure: “In expounding Barth one is therefore required to put in bolder terms what he often only expresses indirectly and by implication” (106). Nor does he always get the emphasis right (see, for example, his note that Barth’s emphasis on grace “implies a negative judgment on certain forms of autonomous human self-assertion” (150, emphasis added)). Yet he is sensitive to the problem and while keen to present and support his central thesis, acknowledges the very real tensions that remain between Barth and the classical tradition: “If Barth can accompany classical eudaimonism for a stretch of the road, he must part company with it eventually” (129). Why so? The reason lies within Barth’s strictly theological, indeed christological, rendering of God, creation, nature and humanity. 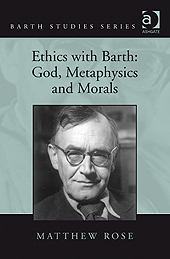 Nevertheless, on the basis of these presuppositions, Barth’s ethics are a (distinctively Christian) form of eudaimonism, in which God is the source and measure of human well-being, and his command is “at bottom … an invitation to fulfil the same movement that has set us in motion” (122). This well-written work which displays an excellent command not only of Barth’s corpus, but also the secondary literature, the historical and philosophical tradition, and contemporary disputes and discussions, deserves and rewards careful reading, even if in the end one cannot agree with all that Rose argues. 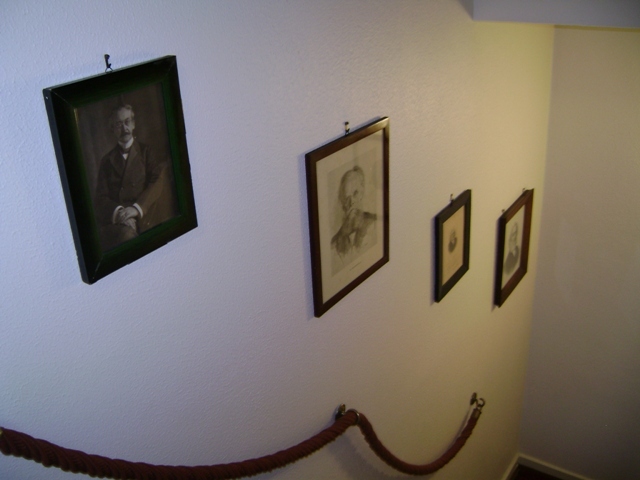 Karl Barth had photos of nineteenth century theologians on the wall as he climbed the steps to his study. Apparently he used to ask his students if their photograph would one day join this line of distinguished theologians. Karl Barth wrote these words (in Protestant Theology in the Nineteenth Century, xii) about his students who, having learned the new theology he taught, were highly critical of what went before. Barth himself was highly critical of most voices of nineteenth century theology, but his criticism was grounded in careful study of their work, deep appreciation for their circumstances and aims, and a conviction that they too were Christians serving Christ, even if, in his estimation, they were also profoundly wrong. 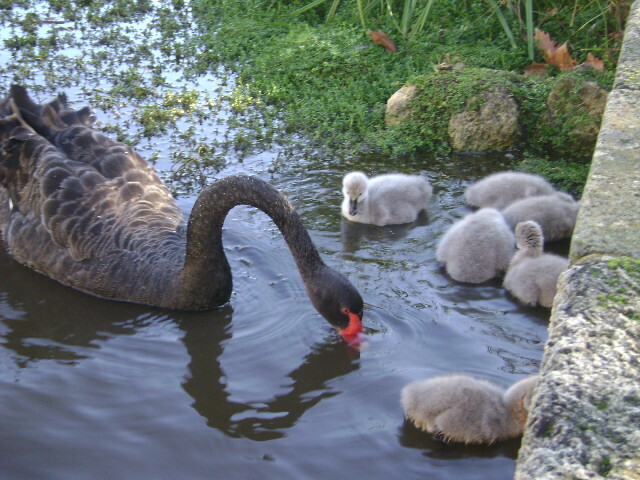 These six little cygnets showed up in the pond outside our window this morning. I have been asked to write a commentary on James 1 for a new project entitled the Global Bible Commentary. So this new series on James chapter 1 will help me prepare for that. I hope you find my reflections on James helpful, and I especially invite your critical comments and homiletical reflections, in order to improve mine. The letter of James begins with the identification of the author simply as “James,” further described in general terms as a servant of God and of the Lord Jesus Christ. Evidently this particular James was sufficiently well known to his readers as not to require further identification. Who then, was this James? The New Testament refers to a number of people bearing this name: James the son of Zebedee and brother of John who was martyred by Herod (see Acts 12:2), James the son of Alphaeus who was one of the twelve (Matthew 10:3), James the brother of Jesus (Mark 6:3), James the Less whose mother Mary was present at the crucifixion of Jesus (Mark 15:40), James the father of Judas who was also one of the twelve, and to be distinguished from Judas Iscariot (Luke 6:16; Acts 1:13), James the brother of Jude (Jude 1), and finally, James, the author of our letter. Robert Wall contends that most scholars believe that the best candidate for James-the-letter-writer is James the brother of Jesus (545). Duling and Perrin contend precisely the opposite, arguing that most scholars believe the work to be pseudonymous, although undoubtedly referring to this particular James (482; cf. the table in Davids, 4). A number of recent evangelical commentators have analysed the various arguments against the traditional idea that the author is in fact James the brother of Jesus, and have concluded that the arguments are less than convincing, and that consequently there is no good reason to reject the traditional view. a) The Greek of the letter is too sophisticated for a working-class Jew from Galilee. This argument ignores the degree of interaction between Jews and Greeks in Galilee in the period when James was a child, as well as the testimony of Acts which portrays the church in Jerusalem as composed of both Hebrew and Greek-speaking believers, and James as one who cites the Septuagint in Acts 15:17-18.
b) The James we see in Acts is so Jewish and so conservatively so, he could not possibly be the author of this letter. It is true that Acts 21:15-26 portrays James as one “zealous for the Law,” and who makes a distinction between Jewish and gentile Christians. Yet the Letter of James is also thoroughly Jewish in its style, orientation and world of thought. 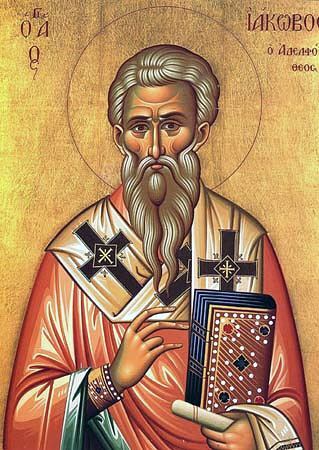 The James of the letter is concerned for the purity of the people (1:27; 3:17), their faithful observance of the Law (1:25; 2:8, 10-12; 4:11-12), the plight of the poor (1:27 – 2:17)—all consonant with the picture of James found in Acts and Galatians 2. If we accept the traditional view, what can we know of James, the Lord’s brother? Mark’s account suggests that Jesus was the eldest of five brothers (James, Joses, Judas and Simon), and that he had at least two sisters. If Mark’s order of the brothers is chronological, James would have been the next after Jesus. We know also that in the earlier days of Jesus’ ministry James and his other brothers did not believe in Jesus (John 7:1-5), and in fact, thought that he was not in full command of his faculties (Mark 3:20-21; cf. 31-35). Yet Luke notes that Jesus’ brothers—including James, we suppose—were part of the company that met “with one mind … continually devoting themselves to prayer” in the upper room after the ascension of Jesus (Acts 1:14). What had happened to turn their unbelief? We find a clue to the answer in the words of Paul in 1 Corinthians 15: “then he appeared to James, then to all the apostles” (v. 7). I grew up in a family of six boys, often at strife with one another, and I can only imagine some of the things James may have said to his elder brother! Yet in an act of grace as much human as divine, the resurrected Jesus appeared to James, and, although we have no record of what transpired at that meeting, its impact on James evidently was immediate and lasting. Some years later when Paul wrote to the Galatians he mentions James of one of those who “were of reputation” in Jerusalem, and names James ahead of Cephas (Peter) and John as those reputed to be “pillars” in the church (Galatians 2:2, 9). That James appears to be the leader of the church in Jerusalem is affirmed again a few verses later when Paul speaks of “the coming of certain men from James” (v. 12). Further testimony to James’ growing stature in the Christian community at Jerusalem is seen in Acts. After Peter’s miraculous release from prison he went to a house where believers had gathered in prayer. After assuring them of his safety he instructs the gathered believers to “report these things to James and the brethren” (12:17). In chapter fifteen James appears as the head of the church in Jerusalem, likely Peter’s successor after the latter’s escape from prison and subsequent “disappearance.” James sums up the proceedings of the meeting and his recommendation, framed theologically according to Scripture, is accepted by all those present. We hear of James once more in Luke’s account when Paul, during his final trip to Jerusalem, went in with the brethren “to James, and all the elders were present” (Acts 21:17-18). In the book of James, then, we have Christian testimony from the earliest days of the church, by one who we think was the very brother of Jesus, a man of holy and widespread reputation, one who gave his life as a martyr, another “of whom the world was not worthy,” and thus now acknowledged as a hero of the faith, who, “though dead, yet speaks” (see Hebrews 11:4, 38). We do well, therefore, to give our very best attention to his message.